This image gives an indication of the shapes of the various waveforms available in Sources. Apart from “Sine” and the two rotating waveforms (not shown), all of these waveforms respond to the ratio property – moving the position of the peak forwards and backwards. 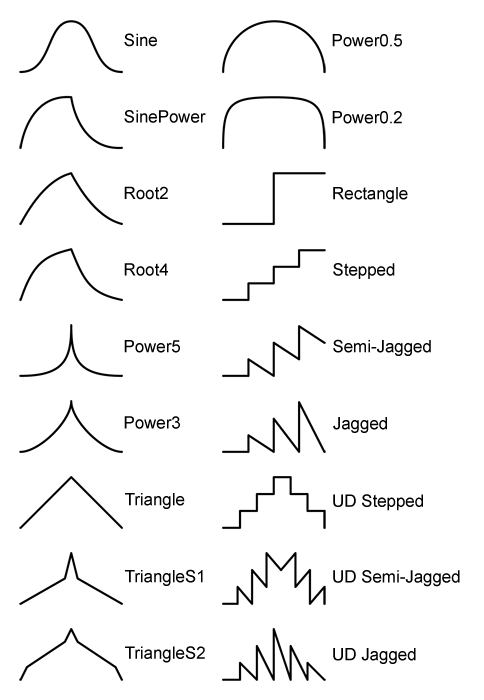 The last 6 waveforms – the stepped/jagged type – have an additional pair of parameters. The number of steps can be varied via the “step” property, and the steepness of the vertical parts of the waves can be varied via the “smooth” property. In the case of the UD (Up Down) waveforms, the steps property controls the number of steps on the “Up” part. If you set the number of steps to 1, you can obtain a uniform colour field which can be varied between low and high via the ratio property. “Rectangle” also has a “smooth” property to affect the steepness of the rising part of the waveform. TriangleS1 (Sharpened 1) and TriangleS2 are essentially triangular waveforms, but they have high or high and low colours respectively “sharpened” via peaks in the waves. Both of these wave types have a smooth parameter – this affects the spread of the peaks. Depending on zoom, etc, at very low smooth values (<4, say) the peaks may disappear – if so, simply increase the value a little (usually 5 or 6 is large enough). In addition there are two “rotating” waveforms – square and sine. These do not respond to the ratio property. Both have use really only during animation – rather than propagating outwards, the waveforms cycle in a fixed place. Square (rotating) is like a rotating square rod with sides painted alternately with low and high colour. Sine (rotating) is like a circular rod with a continuous sinusoidal change from low to high and back again.